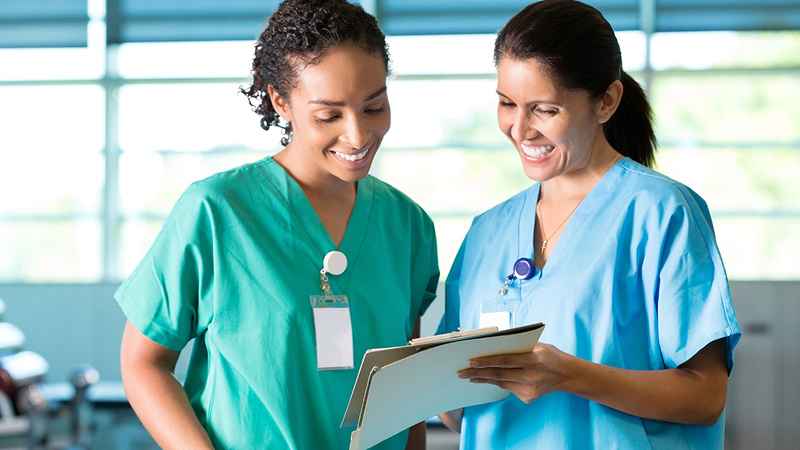 For a nurse, self-confidence is central to successful education, high-level performance, professional advancement, and career and life satisfaction. At the same time, there are plenty of factors that can break down a nurse’s confidence over time without intervention. Let’s explore 7 tips for increasing confidence as a nurse. Every nursing professional needs a solid sense of self. One key to confidence is knowing who you are and what you stand for. That sense of self can come from a deep understanding of your motivations, desires, strengths, weaknesses, and goals. Psychotherapy, counseling, and/or coaching can help you explore this. As a healthcare professional, boundaries mean that you’re selective about what personal information you share with colleagues, who you interact with in the workplace, and who you see outside of your place of employment. Boundaries are also central to successful nurse-patient relationships. Knowing where your responsibilities begin and end is important, as is the ability to assert those boundaries when tested. This isn’t easy for the nurse who just wants to please everyone. Nurse-to-nurse bullying -- also known as lateral violence and/or horizontal violence – is a scourge on the profession, and being bully-proof is sadly necessary. We’ve also seen reports of physicians bullying nurses and other permutations of aberrant workplace behavior. Bully-proofing means you have a strong sense of self (see #1), and that your personal boundaries are impregnable (see #2). Understanding what bullies look for in their targets is key. Bullies are attracted by low self-confidence and a passive communication style. Hold your head high, make eye contact, and stand up for yourself. You also need to make sure you know what bullying is. Physical intimidation is obvious, as is verbal criticism and other conversational behaviors meant to harm you. Subtler forms of bullying include: refusing requests for help; offering intentionally misleading information; purposely setting you up to fail; directly sabotaging your work (e.g. : hiding equipment you need); gossip; social exclusion; and other behaviors. Learning new skills and acquiring new experience and knowledge contribute to your confidence (and competence) as a healthcare professional. As you learn and grow, you can become even more effective. We can learn from online courses, webinars, podcasts, and articles, as well as live conferences, and seminars. New knowledge can also be attained through membership in professional organizations that provide learning opportunities for members. Sometimes we make career choices based on what other people say, not what we truly want. Parents, teachers, friends, and colleagues have no shortage of opinions, but you can’t heed them all. When we choose a specialty or employer based on the opinions of others, that can be a recipe for misery. Listening to what smart people have to say is helpful, but we all need to make informed choices that have the greatest possibility of creating the lifestyle and work style that is best for us. Being emotionally and relationally intelligent empowers you to speak your mind, make your own choices (see #5), be a bad target for a bully (see #3), assert your boundaries (see #2), and develop a stronger sense of self. The skills of emotional and relational intelligence can be learned. When your communication skills become stronger and your ability to perceive the subtleties in your interactions with patients and colleagues more keen, you can feel increasingly confident in your ability to navigate any situation. Most nurses are likely obsessive-compulsive perfectionists, thus letting go of perfectionism can be the heaviest lift of all. When we practice humility, admit our flaws, and assure ourselves that our self-worth does not include perfection, we can relax, enjoy ourselves more, and feel less pressure. If childhood messages of a Puritan work ethic are deeply ingrained, you may need to unravel them in therapy or counseling. Self-confidence is a lifelong work in progress, and our level of confidence will change depending on our experiences and circumstances. The most important thing is to acknowledge that learning and growing are essential and that there’s always more to learn. Be yourself, dig deep into who you are and what you stand for, and your confidence can grow from knowing yourself as deeply as you can. We need confident nurses, and confident nurses are the most empowered, effective, and excellent colleagues, employees, and team players.